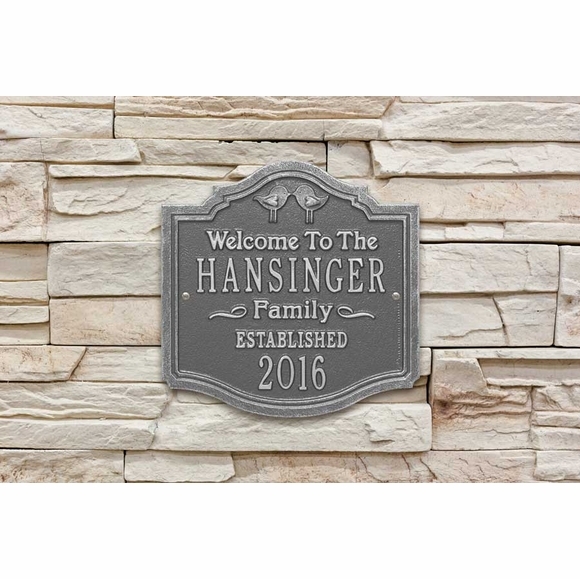 Welcome Sign with Kissing Birds - - personalized Welcome To The Family wall plaque. Includes a pair of kissing birds at the top, the family name, and year. Made in USA. Here's an awesome wedding, anniversary, and housewarming gift! Name line holds up to twelve (12) 1.25" characters. On Year line, please use the 4-digit format shown in sample. 11.34" x 10.16" enhanced rectangle shape. Large image shown in pewter/silver. Smaller images (from left to right) are antique brass, antique copper, black/gold, bronze verde, oil rubbed bronze, bronze/gold, and pewter/silver. Dimensions: 11.34" x 10.16" x 0.32". Kissing Birds welcome plaque custom made in the USA.